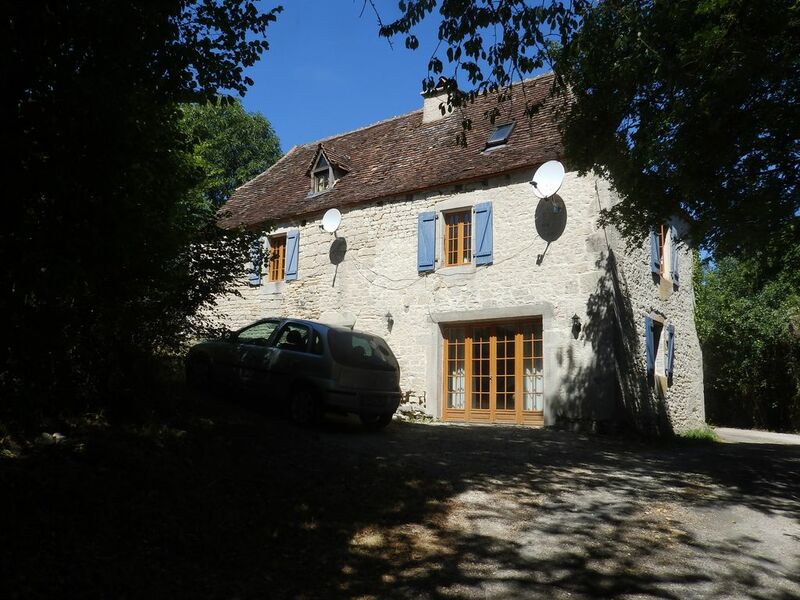 We have a very comfortable 1 bedroom Gîte, which is the ground floor of the main stone farmhouse. With its own separate entrance though French doors, you can relax and enjoy your own space. Background central heating along with a wood burner ensures that the gîte is warm in the colder months (a large basket full of logs is supplied - further logs can be purchased if you wish to keep the fire blazing 24/7) and in summer the accommodation is naturally cool. The bedroom/sitting room has a double bed, a comfortable sofa, a woodburner in a large inglenook fireplace, TV with DVD player (DVDs available on loan), and opens onto a private terrace with seating and barbecue. The bathroom has a large corner bath, separate shower, WC and bidet. The small fitted kitchen gives you everything you need - fridge, cooker, microwave, coffee machine, kettle etc. There is also a small dining area. The gîte is ideal for a couple, but if required we can provide a cot and/or a single bed for children. Guests enjoy discounted golf (free if staying 10 days or more) and free use of all the other facilities. Of course all guests in the gite can enjoy the use of all the communal facilities including pool, games room, restaurant and bar. With 66 acres of fields and woodland to explore, plus a 9 hole golf course, croquet lawn, swimming pool, bar and restaurant, you can relax and enjoy the beautiful surroundings. With the big 50 looming and battling to earn a living in recession hit England, we felt the time had come for a change of life and scenery. Having enjoyed many holidays camping in France we looked for the opportunity to open a small family friendly campsite with additional accommodation for those who prefer something a little more solid to sleep in. Eventually, after all the tribulations of selling up in a recession, we finally arrived complete with daughter and dog in August 2011 and immediately set to work to bring a dead business back to life. After much hunting in the South West of France we found Domaine de Bourrat as we were looking for a property with a gite, camping, pool and the possibility to open a bar and restaurant. Domaine de Bourrat offered us all this in 66 acres of a private valley and a 9 hole golf course as well! The immediate surroundings are beautiful, the area is full of medieval towns and villages such as Rocamadour, St.Cirq-la-Popie, Sarlat, Martel, Figeac, Cahors, plus wide, slow flowing rivers and spectacular scenery. With 66 acres of fields and woodland to lose yourself in, you can always find a peaceful spot to enjoy the sunshine and maybe see some of the many deer that share our land. Golfers will enjoy the challenging 9-hole par-3 golf course and the views down the valley. Families will have fun in the 14m x 8m swimming pool complete with solar shower, sunbeds, tables, chairs and sun umbrellas which is shared with our other guests. We will be happy to explain the mysteries of croquet, and our games room has a pool table and darts, plus board games for children. The air conditioned bar and restaurant is open all day for drinks, snacks, ice creams and meals, plus we have regular barbecues and themed buffets, plus occasional live music. And animal lovers will enjoy meeting our dogs, donkeys and horse. The choice of holiday is yours - peace and tranquillity or socialising in this beautiful part of France. The small fitted kitchen gives you everything you need - fridge, cooker, microwave, coffee machine, kettle etc. Je vous remercie. Nous espérons vous revoir à l'avenir. Domaine de Bourrat is 5 minutes from the village of Labastide Murat & within the Causses de Quercy Regional Natural Park with its own special beauty, as the rivers have carved their way through the limestone to create numerous wooded valleys & gorges. Situated in a private valley, Domaine de Bourrat offers a tranquil setting yet within 15 minutes of the A20 motorway that connects Paris to the Mediterranean & Spain - the ideal destination for those wishing to explore the Lot & an easy stop-over point for those travelling to or from the South. The Lot department is a land of beautiful landscapes of dramatic gorges, slow moving rivers & beautiful villages. Largely unspoiled by the passage of time, the Lot department of France is a delight to discover & explore. Labastide Murat is only 5 minutes away and offers a supermarket open 7 days a week, filling station, bank, post office, butcher, bakery, bookshop, bars, restaurants & pizzeria as well as regular markets, fairs & fetes. The area offers something for everyone - beautiful scenery, magnificent rivers, fascinating medieval towns and villages, caves, great food and wine, horse riding, mountain biking, canoeing, or just fantastic weather and the peace and quiet to do nothing.